Frequently misdiagnosed as Alzheimer’s disease, Lewy body dementia is notable for its up-and-down swings that precede the eventual decline. As a family physician/geriatrician, I sometimes speak to primary care physicians about dementia with Lewy bodies (DLB) because of the understanding my spouse and I have gained while caring for our family members during their personal walk with LB disease. I once asked an audience of 400 primary care providers who among them was currently caring for a patient with DLB. Fewer than a dozen hands went up. After my presentation, when I called for another show of hands, most in the room realized they probably had been caring for a patient with DLB under the assumption that it was another type of dementia. If your first reaction to DLB is “never heard of it,” you’re not alone, as the disorder was not consistently recognized until 1996 and not listed in the International Classification of Diseases until 2005. This article addresses the key points of what we have learned and information that will help in the care of these patients. The current consensus is that these neurodegenerative conditions, along with other LB conditions (eg, multiple system atrophy, LB variant of Alzheimer’s, Down syndrome, amyotrophic lateral sclerosis, dementia with brain iron accumulation), are all part of a spectrum of disorders. Experts are still struggling to establish agreement on the taxonomy. LBD is frequently initially misdiagnosed as AD in its earlier stages until the defining characteristics begin to appear. Unlike the gradual, steady decline of AD, LBD is notable for its up-and-down swings before eventual decline. Some family members initially are confused about what they are observing because their family member can function apparently normally one day and exhibit dramatic symptoms the next. The key to appropriate LBD management is earlier recognition. Several consequences of misdiagnosing this condition include exposing the patient to potentially harmful medications (eg, exaggerated response to benzodiazepines and neuroleptic drugs), missing an opportunity to choose effective therapies (eg, better response to cholinesterase inhibitors), and delaying the opportunity to help families understand and cope with the significant burden of this illness. • three suggestive symptoms: REM sleep behavior disorder with acting out of dreams or excessive daytime sleepiness, abnormal brain CT/MRI, and extreme sensitivity to haloperidol and tranquilizers. DLB is considered probable with the presence of dementia plus two core symptoms or one core and one or more suggestive symptoms. It is considered possible with dementia plus one core symptom or one or more suggestive symptoms. Single photon emission CT testing has identified an association with occipital hypoperfusion. MRIs have shown DLB-specific changes, including preservation of hippocampal and medial temporal lobe volumes, compared with AD. Recently, presynaptic dopaminergic deficits in the striatum have been visualized using a 123I-radiolabeled marker (DaTSCAN). These techniques are still in the realm of research institutions and not widely available. The disease evokes many emotions and a great deal of misunderstanding for families. Remembering that all forms of dementia are terminal, note that DLB patients qualify for hospice care to assist in the management of their various symptoms. Early referral often is helpful for families providing care at home. Additionally, referral to a family support group can be beneficial. 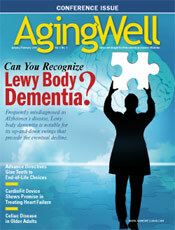 The best information can be accessed from the Lewy Body Dementia Association (www.lbda.org). The mainstay of LBD therapy is cholinesterase inhibitors (eg, donepezil, galantamine), which work better for the cognitive and behavioral symptoms of patients with DLB than those with AD. If the side effects experienced with one inhibitor are troublesome, another may be tried and may work better. If patients experience difficulty taking pills, a patch formulation (rivastigmine) is available. When a patient takes a cholinesterase inhibitor, the reduction in hallucinations and delusions can be remarkable. Selective serotonin reuptake inhibitors can be useful for some patients with depression and anxiety, but the required dosages are smaller than those used for non-DLB patients. Disruptive behaviors (eg, aggression, wandering, hallucinations, delusions) are common in DLB and are frequently the precipitating event for a visit to a physician. Because behaviors are similar to those seen with delirium, the first step in dealing with them should be the elimination of organic causes. Examining for a urinary tract infection, constipation with impaction, and occult infections is always justified. When families insist on pharmacological management, the atypical class of antipsychotics (eg, quetiapine) provide better management of disruptive behaviors because at least one-half of LBD patients are particularly sensitive to traditional antipsychotics and benzodiazepines. Fatal neuroleptic malignant syndrome with fever, restlessness, rigidity, and muscle cell breakdown has resulted from the use of haloperidol. A higher prevalence of cardiovascular problems and abnormal electrical activity evident on an electrocardiogram (ECG) is more common in DLB patients. Because many medications can produce cardiotoxic effects, a black box warning has been placed on the atypical antipsychotics. An ECG should be performed to look for evidence of prolonged Q-T interval or some other conduction defect. This requires a careful explanation to ensure informed consent and agreement about the risks4 in the event of drug use. The use of benzodiazepines or narcoleptic medications will often produce a paradoxical response in DLB, and this can be an early supportive clue to the diagnosis. DLB patients also tend to have more autonomic dysfunction than AD patients, and polypharmacy may result from attempts to control hypotension, constipation, urinary retention, myotonia, and excessive salivation as separate issues rather than as a part of the whole. Many DLB patients will manifest the motor symptoms of Parkinsonism, but unfortunately anti-Parkinson drugs often make the cognitive and behavioral problems worse and thereby force a choice between the lesser of two evils. If simultaneous treatment is to be attempted, the dictum of “start very low and go very slow” certainly applies to patients with DLB. DLB is underrecognized by physicians, and among the general public there is a very limited awareness of the different types of dementia. For years everything was labeled as AD, with little reason to do otherwise, since physicians’ knowledge base precluded any effective management. Now there are good reasons to discriminate these conditions—and the earlier the better. DLB is far more apt to overstress and burden families.5 In facilitating a support group, my wife and I have found that getting people to share their experiences makes them realize the commonality of the bizarre symptoms they see in their loved ones and normalizes the experience so that they feel better able to try new coping skills at home. Grieving is common in DLB families, even long before the death occurs, and a support group provides recognition of this fact and significant comfort. Many caregivers are themselves aged spouses or siblings and are themselves experiencing the onset of personal health issues. They need to be reminded to keep their own doctors’ appointments and be spiritually nurtured in order to remain strong in caregiving. Getting adequate and early assistance for family caregivers helps reduce the strain of caring for someone with dementia. Managing patients with DLB is a difficult and sometimes frustrating task for physicians. Teamwork by office members will help to spread out the busyness of communication with families, medication management, and coordination of community services. The literature about DLB is sometimes hard to find and in a variety of journals. Monitoring the information for physicians on the Lewy Body Disease Association website is a good way to identify new advances in the science and resources that may be useful in patient care. — Charles E. Driscoll, MD, is a clinical professor of family medicine at the University of Virginia and a clinical associate professor of family medicine at Virginia Commonwealth University in Richmond. He is board certified in family medicine and geriatrics with special interest in dementia and frailty in the elderly. — Jean Driscoll, MS, along with her husband, established the first Lewy Body support group for families in Virginia. Together they serve as the group’s facilitators. • A Caregiver’s Guide to Lewy Body Dementia by Helen Buell Whitworth and Jim Whitworth: This book is a comprehensive guide to all things Lewy body. The Whitworths also write a blog, The Lewy Body Rollercoaster, which answers questions, references other sources, and announces new developments (http://lbdtools.com). Jim Whitworth is a cofounder of the Lewy Body Dementia Association. • A Long Dark Night — A Caregiver’s Journey With Dementia by Philip Edward Phlegar Weeks: Weeks is an Episcopal bishop who, in this book, explains his feelings and frustrations with the Lewy body dementia affecting his spouse. He addresses spirituality, sexuality, and the difficulty of getting community services coordinated. • Creating Moments of Joy for the Person With Alzheimer’s or Dementia: A Journal for Caregivers by Jolene Brackey: The fourth edition of this work by Brackey, an activities director in a memory care unit, includes practical solutions and strategies for caregivers wrapped in humor, warmth, and a message of hope. • Learning to Speak Alzheimer’s: A Groundbreaking Approach for Everyone Dealing With the Disease by Joanne Koenig Coste: Coste is a nationally recognized expert in communications techniques. After her experience with a spouse who had Alzheimer’s, she offers her five basic tenets for use by caregivers and provides hundreds of practical tips. • Living With Lewy’s: Empowering Today’s Dementia Caregiver by Amy and Gerald Throop: The authors’ decade of caregiving experience provides the basis for this book. It was written to provide a better understanding of the dementia process and to share practical, safe methods of dealing with specific disabilities and behaviors. 1. 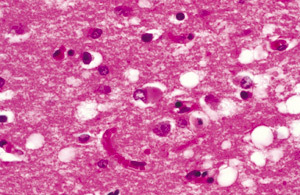 McKeith I. Dementia with Lewy bodies. In Miyoshi K, Morimura Y, Maeda K, eds. Neuropsychiatric Disorders. New York, NY: Springer; 2010:247-254. 2. Galvin JE, Boeve BF, Duda JE, et al. Current Issues in Lewy Body Dementia Diagnosis, Treatment and Research. Lewy Body Dementia Association website. http://www337.pair.com/lbda2007/sites/default/files/2008_current-issues-in-lbd_1.pdf. May 2008. 3. Hibi S, Yamaguchi Y, Umeda-Kameyama Y, et al. The high frequency of periodic limb movements in patients with Lewy body dementia. J Psychiatr Res. 2012;46(12):1590-1594. 4. Parasomnias. In Rowland LP, Pedley TA, eds. Merritt’s Neurology. 12th ed. Philadelphia, PA: Lippincott Williams and Wilkins; 2010. 5. Leggett AN, Zarit S, Taylor A, Galvin JE. Stress and burden among caregivers of patients with Lewy body dementia. Gerontologist. 2011;51(1):76-85.